Due to the collapse of a decade-long property bubble, an economic crisis hit Spain in 2008. Despite the high unemployment rates in Madrid, Madrileños still spend a lot of their free time in restaurants and bars. The streets are crowded every night, and to every restaurant and bar you go, you have to look for a free spot. The Spanish crisis – also known as the Great Recession in Spain, began during the world financial crisis of 2007-2008. Today, Spaniards still carry the burden of this great depression. Unemployment rates are higher than ever – around 24 percent of the Spanish people cannot find a job. Furthermore, the taxes were raised from eight to twenty-one percent in 2012. This major increase has cramped consumption drastically. Interestingly enough, in Madrid it does not seem to have great influence on the social life in the city. Madrileños are very social people. Going out at night and meeting up with friends at bars and restaurants is very important to them. “Every night, starting from approximately 8PM until 1AM, our bar and all the other places in this street are completely crowded. 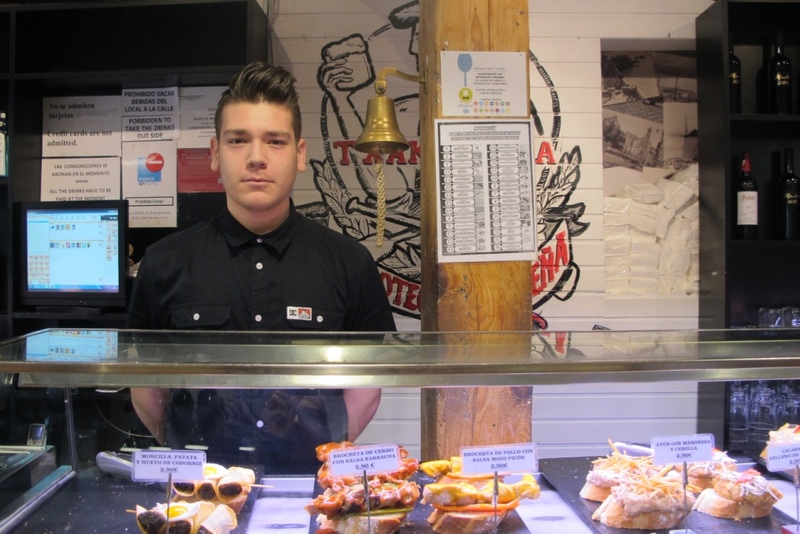 The locals come to have drinks and pintxos, a typical Spanish bite, while catching up with friends and relaxing after a day of work”, says Mario, a 20-year-old who works at a bar in Cave Baja, one of the most famous streets Madrid that is renowned for its tapas. “I love Madrid because you can find everything you want here. The city never sleeps. I love going out at night, but I only have to be careful with how much I spend”, Celia Recio, a Madrid local explains. Since the economic crisis, many people have been unemployed and the incomes of those who are working are often very low. “Even though Madrileños have to try hard to get to the end of the month with their salaries, they still go to bars and restaurants all the time”, Mario explains. 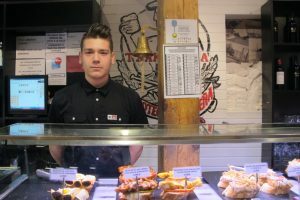 “You could say that the trend of eating tapas and pintxos with friends is a way to escape the heavy burden of the recession.” One could ask how it is possible for unemployed or poor people to afford going to restaurants and bars multiple times a week – “The tapas concept in Madrid makes it very cheap for people to come to the restaurants and bars. When you order some beers, you often get free tapas on the side. Furthermore, the prices are pretty low, so it is a combination of factors.”, concludes Mario from Txakolina. The crisis does not only affect working class. The students are looking for cheaper ways to organize their social gatherings as well. The so called botellóns are more popular than ever. The concept is simple: young people go to the supermarket and buy alcohol, which they mix with juice and soft drinks in big plastic bottles. They get together in the middle of the street and other public places to have a drink. Consequences are that they often get very drunk. Although botellóns can cause some uproar, in general it is a common thing in Madrid. It does not look like Madrileños are planning on staying in their houses any time soon. The people care very much about their beloved social gatherings. The streets of Madrid seem to be more alive than ever and the locals live around the clock.